Arrive in Manfredonia: Time to explore the town with its port, castle, etc. Note: Some of the walking distances on this itinerary are relatively short, allowing time for swimming (summer/autumn), etc. There are also opportunities - subject to timetables - for seasonal scenic boat trips around the coast, between Peschici, Vieste and Manfredonia. Manfredonia to Monte Sant’Angelo: Walk along the coast then across a small plain before ascending an ancient pilgrim route, once used by crusaders before they embarked for the Holy Land. The route, now a grassy ravine with ruined monasteries on either side, leads to the ancient town of Monte Sant’Angelo (2,755ft), with its whitewashed houses, steep narrow alleys and stairways, and views across the bay of Manfredonia and coast to the south (9.3 miles, 5 hours/bus 20 mins!). Monte Sant’Angelo to Mattinata: Time to explore the town and visit the famous cave church, venerated as being the last place St Michael appeared on earth in 491 AD, before setting off down a well-made pilgrim path to the small town of Mattinata (650ft) set in olive groves, close to the coast (9.2 miles, 5 hours). Fabulous cliff-top setting with outside pool, jacuzzi and access to the sea. Mattinata to Baia Fontana delle Rose: Follow paths along the coast and into hills overlooking the sea, before descending to the picturesque bay of Fontana delle Rose (7.3 miles, 3.5 hours). Agriturismo: working farm with panoramic views. Simple but comfortable, family-run refuge in Umbra Forest. San Salvatore to Rifugio Sfilzi: Walk through olive groves, enclosed meadows and pastures, gently climbing toward superb views of the coast, its small historic towns and villages. Paths then lead into mixed woods of centuries-old maple and oak trees, and continue into the heart of the Foresta Umbra, a nature reserve within the Gargano National Park, with the best-preserved area of ancient woodland in Puglia, containing many centuries-old Aleppo pines, oaks, yews and beech trees, an abundance of birds and animals and more than 65 different types of orchids. Tranquil tracks through beech wood then bring you to the warm hospitality of Rifugio Sflizi, in the heart of the forest (15.3 miles/8 hours). Family-run B+B with wonderful sea views. Rifugio Sfilzi to Peschici: Follow forest tracks and meadows... and emerge to follow an open ridge offering extensive views of the Adriatic coast, the Gargano Massif, and clustered ‘white village’ of Peschici in the distance. Then continue down through olive groves and quiet lanes to your hotel overlooking the sea at the foot of picturesque Peschici, its white-washed houses and alleys perched on a limestone spur (9 miles/5 hours). Limestone hills rising to 2,700 feet with coastal paths, quiet lanes, farm and woodland tracks and pilgrim routes leading up to Monte Sant' Angelo, ancient forest trails. Occasionally rough under foot. An abundance of flowers in spring, including some species unique to the area. The fitness level for this trip is Grade 3-4. Excellent local seafood, olive oil, interesting and original pasta dishes; delicious sheep's cheese and lamb from the high plateau. The area is famous for its breads, biscuits and pastas, which are distributed throughout the country, and more than 50% of Italy's output of olive oil comes from Puglia and Calabria. Puglia is one of Italy's largest wine producers (growing almost one fifth of the country's wine), much of which is consumed locally, or goes north to Piemonte to be used in the production of Vermouth. More recently the emphasis has been placed on producing wines of greater quality, and the region now has over 20 DOCs. Ps. Our visit to the Masseria and meeting Francesca and Antonio was extraordinary, a once in a lifetime experience! We were pleasantly surprised by how warm the sea was in October. Swimming was an excellent way to finish the daily walks. The seafood and pasta dishes were also a highlight. We went in late April specifically for the flowers and we were not disappointed! The Gargano National Park must be one of Europe's best-kept secrets. We barely saw a soul on the walks. It was magical. My husband and I recently completed a late-June Gargano trip with our two daughters (ages 9 and 11 years). The trip was absolutely wonderful and the Gargano peninsula a discovery which we plan to return to. The scenery is beautiful, the food delicious and the ATG experience completely unique. In particular, the experience of the traditional farm run by Francesca and Antonio, complete with kittens and a puppy, is one that our daughters will remember. Matteo was fantastic - his enthusiasm, knowledge and warmth are clearly apparent. We booked extra nights at Mont Sant' Angelo and Baia Fontana della Rosa, which I recommend, as both locations worth an extra day. All in all, I highly recommend this trip! Excellent support and advice from our route manager, Matteo, who personally contributed above and beyond the call of duty. He marked out the trail in a way which ensured that we found our way without difficulty. Twice or three times our walks ended on amazing beaches and we walked the beach and swam. Terrific. with each itinerary. Because of its easterly position, weather in the Gargano can be extremely variable, particularly in April. It can be cold, wet, warm and dry - all in one day (bring layers). The major draw of April however is the astonishing display of flowers, some unique to this area. In May and June the Puglian coast will normally be warm and dry, though with cooling breezes, and nights can still be cool. Walking could be either in shorts or trousers, and an extra layer is recommended for evenings or after swimming. 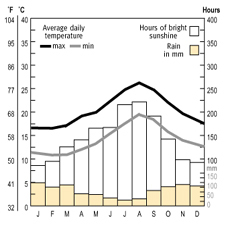 In September and October the temperatures will still be generally very warm and settled, though again with cooling coastal breezes; and the sea still warm for swimming. Puglia is the driest region in Italy - but bring a waterproof just in case! This is an 8-day trip with walks offered on 6 days. The length of each day varies from 3.5 to 8 hours walking. Hours of walking, which may vary from individual to individual, means hours of actual walking and does not include stops for lunch, sightseeing – or swimming! The fitness level of this trip is Grade 3-4. The terrain includes farm and forest tracks through woods, scrub and olive groves; meadows and beaches; and quiet surfaced lanes. Some of the walking is limestone terrain, occasionally rocky, for which walking boots with a firm sole and ankle support are recommended. There are also a few sharp descents and ascents. The use of trekking poles is highly recommended on this trip. climbing approximately 800m from sea level to the highest town on the peninsula. Day 6 is long but rewarding. The recommended destination airports for this route are Bari, Pescara or Naples. All airports have good connections to their local train stations. Please visit www.trenitalia.com (select English language) for train timetables. Whichever airport you fly into, you will need to travel to Foggia and from there take a bus to Manfredonia, if travelling by public transport. IMPORTANT NOTE: Please remember to validate any train ticket you purchase in Italy before you board the train by stamping it in the yellow or green and white machine at the entrance to the platform; your ticket is not valid for travel unless you do this and you can be fined if you fail to do so. Train: There are regular buses from Bari airport to Bari central station (30 mins, from €4) and from here, there are regular trains to Foggia (1-1.5 hours; €10- €13). For timetables, see http://www.trenitalia.com/tcom-en. From Foggia, see below. Bus: there is a direct bus service from Bari airport to Foggia train station leaving at 9.30 - 12.30 - 15.30 - 18.30. Journey time 1.5 hours. Check timetables at www.metaurobus.it (click ‘Orari’ and ‘Puglia airbus’). Taxi: from Bari to Manfredonia costs from €150 (€200 for larger parties/minivan). Prices may be higher on Sundays and public holidays. Train: Take bus no. 38, departing every 15 minutes, from the terminal to the train station in the centre of Pescara (tickets are sold at the automatic machine in the terminal arrivals area). From the station there are trains to Foggia approximately every hour (journey time from 1.5 hours, €24-€36). For timetables, see http://www.trenitalia.com/tcom-en. Taxi: from Pescara to Manfredonia costs from €250. Prices may be higher on Sundays and public holidays. First you must get to Naples Central Train station - there are bus shuttles every 20 mins which cost €1.30. You can buy tickets on board the bus or also at the Sun Store shop in the airport. Taxis are also readily available. Bus: From Naples central train station in Piazza Garibaldi, there is an hourly bus to Foggia train station (2 hrs; approx. €11). See www.clpbus.it for timetables. www.flixbus.it. Tickets can be purchased online (slightly cheaper) or on board. Train: there are trains but these involve one or two changes, often to a bus service and can take between 3 to 6 hours, so we recommend the bus service. Foggia to Manfredonia by Bus: There are regular (hourly) buses from Foggia train station to Manfredonia. Timetable: www.sitasudtrasporti.it or www.trenitalia.com. The journey is approx. 40 minutes and the ticket, which costs approx. 3 €, can be purchased in the tobacco shop at the train station or from the “Bar Kiwi” in the Piazza della Stazione. Alternatively, the Ferrovie del Gargano bus company has buses departing from Foggia train station to Manfredonia train station at the following times: 10.00, 11.30, 13.35, 14.05, 16.50. 19.15 and 20.55. Once you arrive at Manfredonia station, you can either take a taxi to your hotel (see below) or you can walk from the bus stop to your first hotel along the seafront promenade (see below); approximately 1.7km. FOGGIA TO MANFREDONIA BY TAXI: If you prefer to take a taxi between Foggia and the first hotel, the office will be pleased to book this for you (journey time 30 mins; from €40 or €60 for larger parties/minivan). This is a special price negotiated with the local driver we use – you can even make the booking directly if you prefer, his name is GIANCARLO CIOCIOLA, and contact details are as follows: Tel: +393355316621, e-mail: autonoleggiciociola@tiscali.it. From Manfredonia station: For buses to the hotel you can take the LINEA 5 (line/number 5) from the bus stop on the same side of the road as the station. Tickets can be bought from Bar della Stazione on the opposite side of the road, no. 64. It is a short journey and the hotel is along the seafront. To walk (1.7km): From the train station turn R along the main road and after 400m, at the big junction with green public tap, don't cross the zebra crossing but turn R and follow the seafront for 1.2 km. Hotel Panorama del Golfo is on your R.
If you prefer to take a taxi for this last stretch, you will find taxi numbers under Manfredonia in your Route Booklet. If, however, you are arriving in Manfredonia on a Sunday (when activity in the town is at a minimum!) we would recommend pre-booking your taxi. The office will happily organise this for you. Alternatively; if you are unsure of your travel connections in advance, ask the office to pass on the Route Manager’s mobile number so that you can liaise directly with him/her to organise a taxi once you have embarked on your train journey and have a clearer idea of your ETA in Manfredonia. • If you change your flight please notify us on 01865 315678 so we can contact the taxi company to reschedule the taxi for you. • If, on the day of departure, your flight is cancelled or you miss or change it, please immediately contact the ATG emergency number 01865 315600 so we can contact the taxi company to reschedule or cancel the taxi for you. • If you are delayed and you have arranged for a taxi to meet you at a non airport location (e.g. train station) it is essential that you contact your Route Manager or call the ATG emergency line to notify us at the earliest possible moment, so we can contact the taxi company to re-schedule or cancel the taxi for you. Cars can be left in the car park of the Hotel Panorama del Golfo free of charge, at the owners’ own risk. (courgettes) which are widely used in antipasti, etc. green that the recipe often combines with anchovies for even greater depth of flavour. Savoury breads and pastries are popular and include such specialities as taralli, rings of dried baked bread, sometimes infused with fennel seed or chilli. Puglian bread is good – unlike in Tuscany and much of Umbria, salt is used in the recipe, making for a good tasty dough! The Pugliesi are fond of their sweet pastry desserts. The coast is a source of shellfish such as cuttlefish, mussels, sea bass, calamari, sea bream and clams, whilst further inland (eg in Monte Sant’Angelo) more meat can be found on the menu. Vermouth. More recently the emphasis has been placed on producing wines of greater quality, and the region now has over 20 DOCs. Around the Gargano Peninsula grow the wines of La Capitanata – middle-weight reds and light whites, whilst further south, around Lecce, heavier reds and fine rosés are more common. There is no need to dress up at any of the eateries on this route. The area is casual. 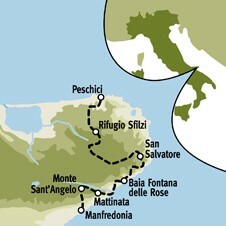 All do except for Masseria Sgarrazza and Rifugio Sfilzi. The recommended airports for this trip are Bari, Pescara and Naples. All airports have good connections to local train stations. There are regular trains Foggia, from Bari (1 - 1.5 hours, €10-€13) and from Pescara (1.5-2 hours, €24- €36). There is an hourly coach service from Naples to Foggia (2 hours, €11), and a twice-daily service direct from Naples airport. From Foggia there are regular bus connections to Manfredonia (40 mins). Taxi to the first hotel: from Bari airport €150; from Pescara airport €250. Prices may be significantly higher on Sunday sand public holidays. Taxis can be booked via the ATG office. For more detailed information on reaching the route, see Frequently Asked Questions below.